When it comes to Christmas, there are the obvious all-round flavours we think of – clovey mulled wine with rolled up cinnamon sticks like fat cigars, clementines pierced with a thumbnail spraying citrus across your fingers, fiery brandy turned petrol blue to pour over the pudding and thick, unctuous port decanted into tiny glasses. Then there are the flavours more personal than predictable – for our household it’s all about apricot and celery stuffing on December 25, a Christmas cake created by my Granny with layers of sugarpaste, marzipan and crumbly fruitcake and the thick, floury skin of a clootie dumpling drowning in custard. Some have gingerbread houses groaning with Haribo, others fluffy mashed potatoes instead of crisp roasties but we probably all have the predictable and apparently endless debate over the inclusion of sprouts on the table. Christmas food is in part predictable and yet variable – I find it fascinating to hear what traditional and non traditional things are served on plates and bowls come 1pm on Christmas Day. Perhaps it’s the journalistic nosiness in me, so thank goodness the Food Blogger Cookie Swap has rolled around once again to give an insight into how food bloggers across the country interpret Christmas into a batch of three dozen cookies. This year I received a wonderful array of tissue lined boxes, brown paper and string packages and cards and tags wishing me a Merry Christmas from Foodie Laura, I’d Much Rather Bake Than, and The Vanilla Bean. Laura’s gingerbread biscotti were perfect – soft with a little crunch and full of festive flavours which is exactly how I like it. Roshni’s earl grey and milk chocolate shortbread arrived just when I needed them in the office and barely lasted the day. And Laura’s perfectly miniature chocolate and hazelnut cookies were so easy to eat I didn’t share them with anyone at all. It’s the Christmas gift that keeps on giving – a sneak peek into the minds of three randomly selected food bloggers from the UK, a taste of what they love to whip up in the kitchen and the flavours that spring to mind when the festive season rolls around. As for myself, the past two years I’ve delivered bags of German Lebkuchen shaped into snowflakes to bloggers and last year soaked dried cranberries in a ridiculous amount of brandy, sprayed toasted pecans with edible gold and chopped a silly amount of chocolate for a fairly traditional Christmas explosion of flavour. 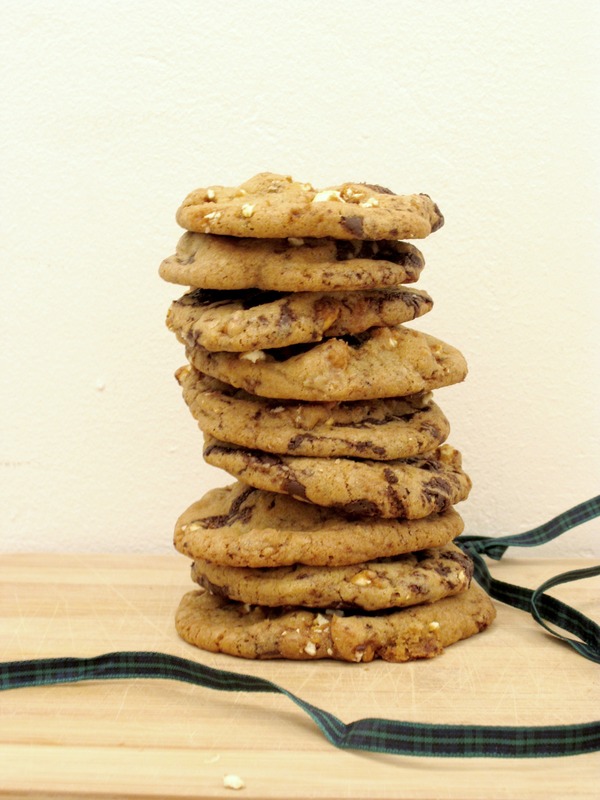 This year I wanted to create a batch of cookie dough that was more modern, something slightly unexpected but a celebration of some of my favourite flavours. Inspired by Joy the Baker’s Popcorn Cookies, I made a batch of salted caramel popcorn inspired by Cookies and Cup’s recipe and folded into my favourite slow-bake cookie dough with chunks of dark chocolate and scooped and topped with sea salt flakes. Perfectly ridiculous and completely delicious, my three lovely recipients Sarah, Ally and Angela were very complimentary about my take on the Christmas cookie. In my eyes, salted caramel has certainly not had its day and although I probably should be calling for caramel to remain unsalted, I just can’t help myself. It works so well with bitter chocolate, the combination first seen on this blog for my sister’s insane 21st birthday cake. 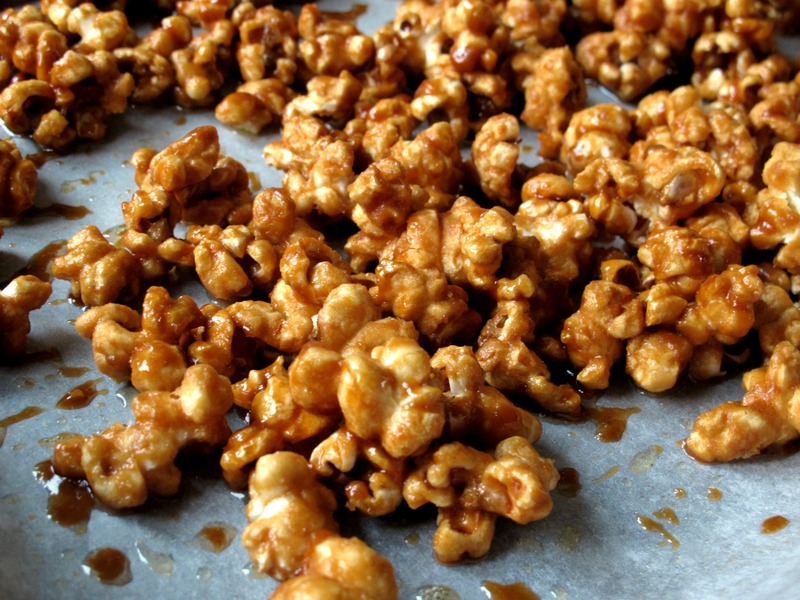 But there is something sort of festive about salted caramel and when stirred through freshly popped popcorn looks satisfyingly golden and gilded. Of course, a cookie isn’t a cookie without a bit of chocolate and the sprinkle of salt lifts the flavour even more. 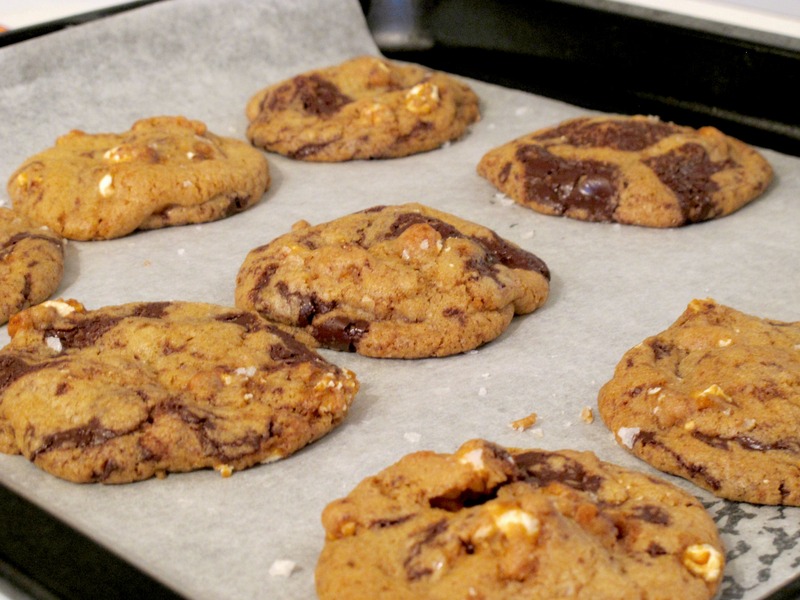 As ever, this recipe make a huge batch of around 50 cookies so unless you plan on baking to hand out to friends and family as gifts (which I wholeheartedly suggest), then simply half the recipe and keep more of the salted caramel popcorn to snack on watching Christmas films instead. First, make the salted caramel popcorn by preheating the oven to 150oc/130oc fan. Line a baking tray with baking parchment and set aside. Place a large heavy bottomed pot like a le crueseut over a medium heat and add the oil. Once hot, add the popcorn kernels and place a lid on the top. Leave to pop, shaking the pan occasionally until there are around 10 seconds between each pop. Remove from the heat and pour the popcorn into a heatproof bowl, discarding any unpopped kernels. To make the cookies, place the brown sugar In the bowl of a stand mixer and briefly beat to break up any lumps. Add the caster sugar and beat again to incorporate then add the softened butter. Beat for around 5 minutes until light and fluffy – at first it will come together like biscuit dough but persevere, it will soften up. Add the vanilla and the eggs and beat until smooth, scraping down the sides of the bowl to ensure the mix is all incorporated. In a separate bowl, whisk together the flour and bicarbonate of soda then fold into the sugar and butter mix. 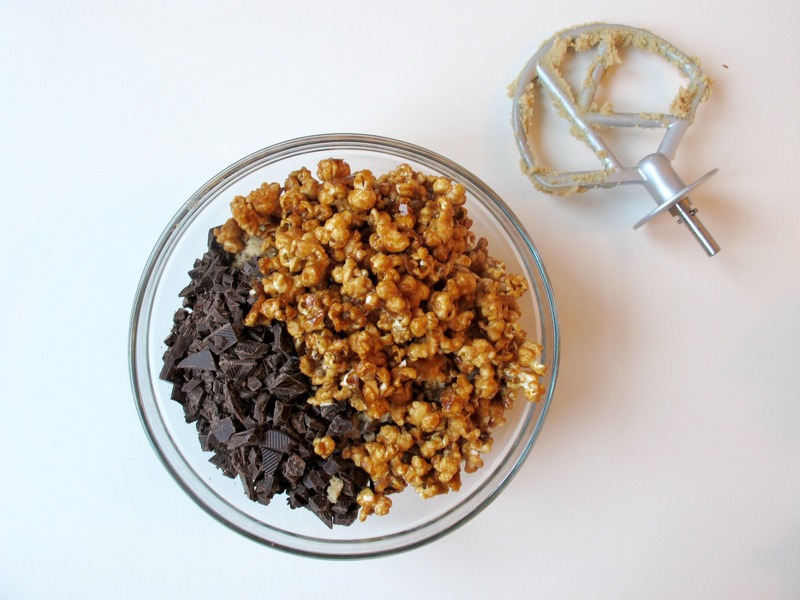 Add the chopped chocolate and salted caramel popcorn and gently fold together with a spatula or even with clean hands. Place in the fridge to rest for 30 minutes whilst you preheat the oven to 150oc/130oc fan and line a large baking sheet with baking parchment. Once ready to bake, scoop tablespoons of dough spaced well apart onto the tray and sprinkle with a little sea salt. Bake for 15-18 minutes until golden around the edges, then remove from the oven and leave to cool slightly. 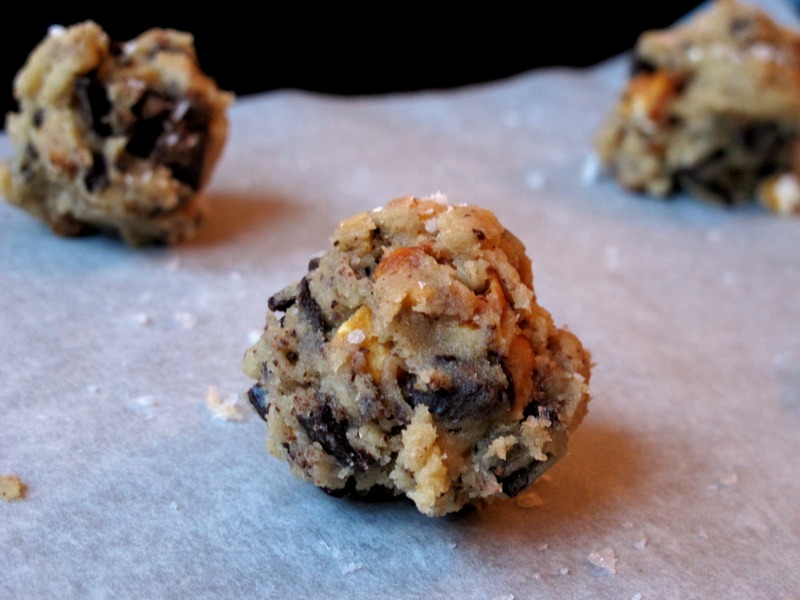 Transfer to a wire rack to cool completely and repeat with the remaining cookie dough. What a talented girl you are!! Sounds absolutley yummy!!!! Will definitely have to give this one a try.